As an experienced marketer, you already know how important it is to stay up to date with the latest marketing trends and technology. You’ve likely already heard of WordPress and may have even used it. Used by over 32% of all websites, WordPress is the top content management systems (CMS), with the richest integration options available. Adding several thousand new integrations or plugins each year, WordPress now has over 54,000 plugins available for download. However, as this search for a Google Analytics integration plugin illustrates, there are a number of plugins to choose from, all ranging in power, purpose, and price. Some WordPress plugins are worth it, some aren’t. There are many to choose from to help improve UI and to help you reach your marketing goals, and even change your approach to marketing. But which are really worth your time? A Google search for “top WordPress plugins” reveals hundreds of list compilations. Some of those compilations are right on, so I’m not aiming to compete with those already existing compilation articles. Instead, I’ve identified the ten WordPress plugins that are true must-haves. A few are ones you likely already have heard of, like Yoast, but we include them here because if you’re not already using them, then you need to pull your head out of the sand and get them installed. I remember a day, not too long ago actually, where most of my clients discounted mobile website traffic because the volume was so low; only five or so years ago most websites were seeing less than 5% of their traffic coming from mobile devices. That has changed though, in a big way. In 2018 52% of web traffic was from mobile devices. That’s why you need a mobile friendly site… or perhaps even a mobile app. 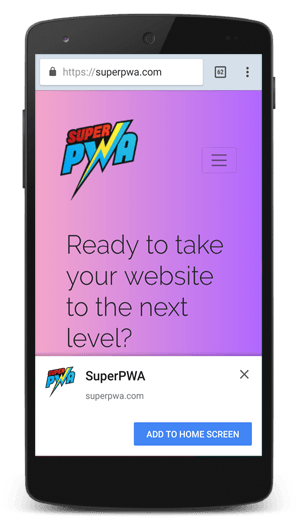 The PWA WordPress plugin allows you to quickly and easily turn your website into a “mobile app” that is accessible from the home screen of a mobile device. Progressive Web Apps (PWA) is a relatively new WordPress plugin that prompts your site visitors to save your website to their home screen. Users can revisit your site by launching the app directly from the home screen on their smartphone, and then use an app-like interface to interact with your website. You even have the option of caching your site pages to their mobile phone so they can revisit your pages while not connected to the web. Obviously, if your site has a heavy content focus and produces new posts or pages regularly, this plugin is the go-to tool for increasing your repeat site traffic. OneSignal — This plugin allows you to show notification opt-ins when people hit your website. Visitors can opt-in to receive desktop push notifications when you publish a new post. The best part is visitors receive these notifications even after they’ve left your website, which can help drive recurring traffic to your website. In fact, this plugin sends over a billion notifications across web developers and users per day! This plugin has only been available for approximately nine months and supports Chrome, Safari, and Firefox. There are other comparable solutions available, however, most of them come with a cost. OneSignal is the fullest featured app and is completely free. Yoast — As an avid WordPress user, you’ve likely already heard of or used Yoast. If you haven’t yet, then you ought to give it a try. Yoast isn’t new but is by far one of the best WordPress plugins available — hence, I’ve included it in this list. Yoast easily shows you where and how to improve your website’s SEO. One example is writing better content. Yoast forces you to choose a focus keyword for your content, and optimize that content by using your focus keyword throughout. Yoast also checks things that you probably forget, such as writing meta descriptions, image alt text, and if you are missing any subheadings, for example. Smush Image Optimization — If you’ve run site speed tests you’ve likely seen that there are optimizations that need to be made on your site, especially in this world where more and more site traffic is occurring on mobile devices. One of the most common suggestions for optimization, from the site speed testing tools, is to optimize your images by decreasing their file size, in order to load your pages more quickly. If you have an existing site, you likely don’t have time to go through and optimize all the old images that have been uploaded. If you have a new site, how will you always remember, and find the time, to optimize your images before uploading them? 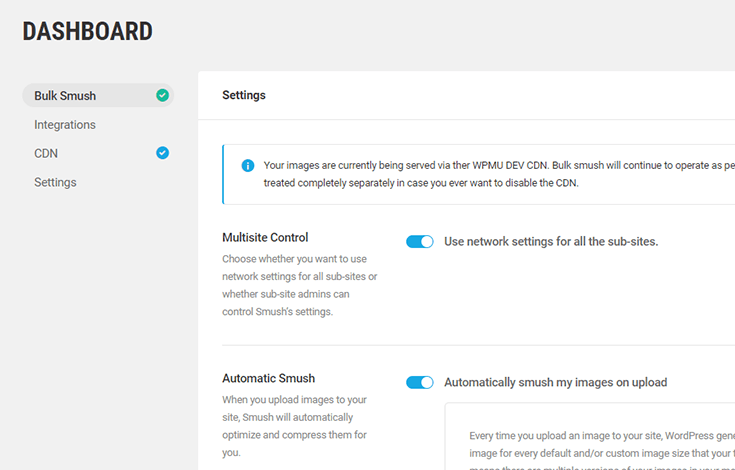 Here’s where the leading WordPress image optimization plugin, Smush, comes in. While not a new plugin, I’ve installed it on many client websites and seen overnight improvements in site speed tests, which then results in improved SEO rankings. The plugin compresses images to an optimal size, cutting out extra data that isn’t necessary, so you’re left with smaller file size images that still look great on your website. If you’d like to learn more about this topic, be sure to read my other post where I discuss, in depth, optimizing image size for emails. All In One Schema Rich Snippets — This plugin provides a short summary of your website or web page in Google, Yahoo, and Bing search results, and even sometimes in Facebook news feeds. It also provides searchers with review ratings, images, and information pertaining to exactly what they are looking for. This newish WordPress plugin has been out for only a few years. Although Google had Rich Snippets for a while, it wasn’t always easy to implement on websites. With this plugin, you now have no reason to not utilize rich snippet functionality in helping your site show up more readily at the top of the search engine results. SendInBlue — If you’re not already using another email sending provider, or if you are unhappy with your current provider, then it may be time to consider using SendInBlue. This plugin allows you to set up marketing automation workflows, create and set up signup forms, and even send SMS messages. SendInBlue has a lot of powerful functionality, making it well worth the price ($25/month for 40,000 emails). If you’re serious about your sending reputation (and you should be), you can also get a dedicated IP for under $200/year. When compared with HubSpot, Marketo, or other marketing automation suites, you’ll realize quickly that SendInBlue is a deal. If you’re already using a lot of the functionality in a full-featured marketing automation platform, I wouldn’t recommend leaving it for SendInBlue — but it is a great plugin to get you into automation if you’re not already there. With the contact forms category in the WordPress plugin library being so enormous, it can be difficult to find the best plugin for such an important aspect of your site: letting your visitors contact you. As such, here are two WordPress contact form plugins I have used, tested, and love: GravityForms and Everest Forms. GravityForms — Frustrated with continuously adjusting and testing forms on your website? Try this plugin. GravityForms is one of the best form-builder plugins for WordPress. It is also easy to integrate with other third-party web applications and services, such as MailChimp, AWeber, FreshBooks, and PayPal. You can purchase GravityForms for a one-time cost of $59, and then begin building and publishing forms on your website in minutes. Consider what you’ve already spent on time and resources building, adjusting, and testing your existing web forms, and you’ll quickly realize that GravityForms is what you’ve been missing. Everest Forms — If you’re facing budget constraints and don’t want to pay for a contact form plugin, I encourage you to take a look at Everest Forms. Similar to GravityForms, Everest does more than just basic “contact us” type forms. While it doesn’t offer all the bells and whistles of GravityForms, it is easy to use, installs well, and should work nicely for most websites. Plus, it is entirely free. Blog2Social — Blog2Social is a plugin that allows you to easily and powerfully share posts on social media, all from within your WordPress dashboard. How is Blog2Social better than other similar plugins? One added bonus is that it allows you to automatically repost old blog posts, helping you to continue to see the value from your evergreen content. Although similar plugins have been available for some time, none of them compare to Blog2Social. Others are often buggy and do not provide quality results. Blog2Social has been available for approximately a year and is built on solid code, making it one of the best plugins for repurposing content. Although Blog2Social is available for free, consider paying the $7 per month so that you can automatically post content to Twitter and Facebook to continue to see value from your evergreen content. “Read More” plugins — Keeping visitors engaged on your website is key. One way to do this is to get your visitors to read your blog and other content your site. There are a few ways in which to do this; however, one of the most effective methods is to add “read more” buttons on your website. A search through the typical read more plugins available to you on WordPress shows you, though, that there are a lot of low-quality options out there. As such, you might need to pay for one of the commercial options I’ve listed below. One plugin that makes this easy is from CodeCanyon. This plugin is well reviewed, works well, and is regularly updated. It is also affordable, costing a one-time fee of $17. Check out a live demo here. Another method is to include related posts in the footer of a web page, as shown here with this WordPress related posts plugin. This plugin has proven to increase internal content navigation by up to 10 percent. It is also relatively easy to search for the posts you want to include in the related posts section and add them accordingly. The third option is Intelly Inline Related Posts, which allows users to include inline relevant content. Intelly will help you to increase engagement, keep readers on-site and engaged with your current content, extend the value of your evergreen content, and also reduce your bounce rate. Nelio — Marketers’ biggest goals are often to increase conversions. Although Optimizely is the leader in CRO, it is also quite expensive. Instead, I recommend Nelio. Not only does it natively integrate with WordPress, it comes with a number of awesome features, such as A/B testing, detailed results and analytics, and heat mapping. 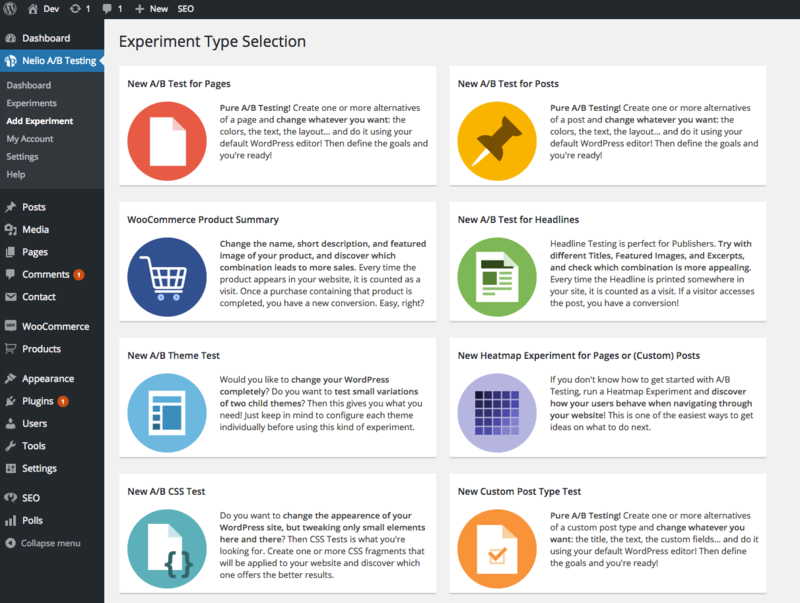 It has many WordPress native testing options, such as WooCommerce product summary testing, theme tests, and post vs. page testing. And for less than $300 a year, you can’t beat the price, especially when compared with Optimizely. As I mentioned above, there are thousands upon thousands of WordPress plugins available, all designed for different purposes. However, this list includes some of the best plugins in terms of functionality, features, and affordability. Reaching your marketing goals just got easier. Get a better idea of the cost for your content plans. See how ClearVoice can help power your content marketing.